Free Lady Gaga Games For Girls! Are you gaga for Lady Gaga?! 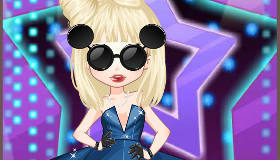 Help this fabulous popstar find some crazy new looks in our Lady Gaga games! If you love Lady Gaga, you’ll know that her fashion sense is wacky to say the least! In the past this flamboyant popstar has worn a hat shaped like a telephone and dresses made from Kermit the Frog dolls, bubbles and meat, so who knows what you might find her wearing in our Lady Gaga dress up games?! One thing’s for sure, she’s not afraid to experiment with fashion, and you shouldn’t be either! Go crazy in these Lady Gaga games for girls: you can give her a brand-new look in makeover games, find insane outfits for her in fashion games, and much more. We know you’ll love the Lady Gaga games in our star games section – have fun, Little Monsters!